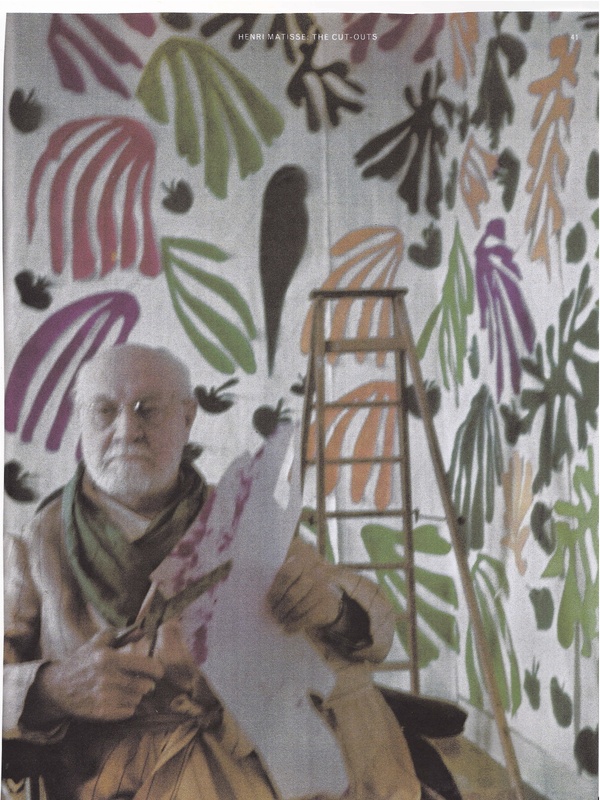 Matisse in his studio working on his Cut-Outs – from Issue 31 Tate Etc Magazine. What would you wear if you were a beautiful young woman, already living with Picasso, and about to be introduced to the older artist, Henri Matisse, who you regard as ‘God’? 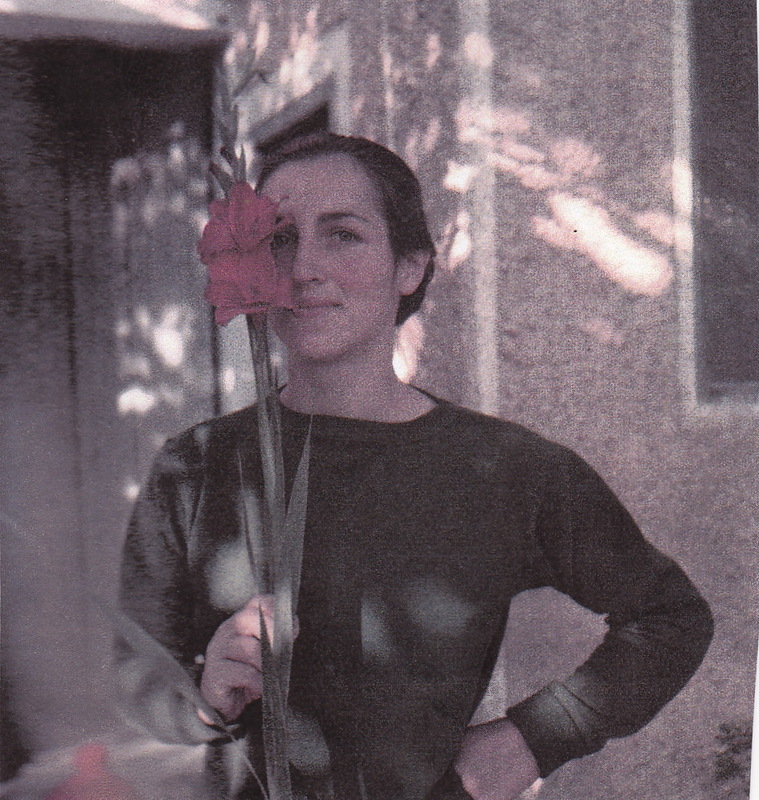 Françoise Gilot holding a red gladiolus, photographed by Gjon Mili, 1948. There is a wonderful series of interviews in the latest edition of Tate Etc magazine which celebrates the uplifting Matisse: The Cut-Outs exhibition at Tate Modern. I loved discovering that the young woman in question, Françoise Gilot, decided on her outfit with knowing precision: “I remember very clearly that I dressed in almond silk trousers and a mauve silk top, because I knew he liked those colours”. The choice hit the spot and during the course of their subsequent friendship Matisse drew and corresponded with Gilot, relishing the disconcerting impact his attention had on the the ten year junior, Picasso. In the same interview Gillot gives a riveting description of watching Matisse make an abstract portrait of her in 1947. Henri Matisse’s gouache cut-out Abstract Portrait of Françoise Gilot (1947). 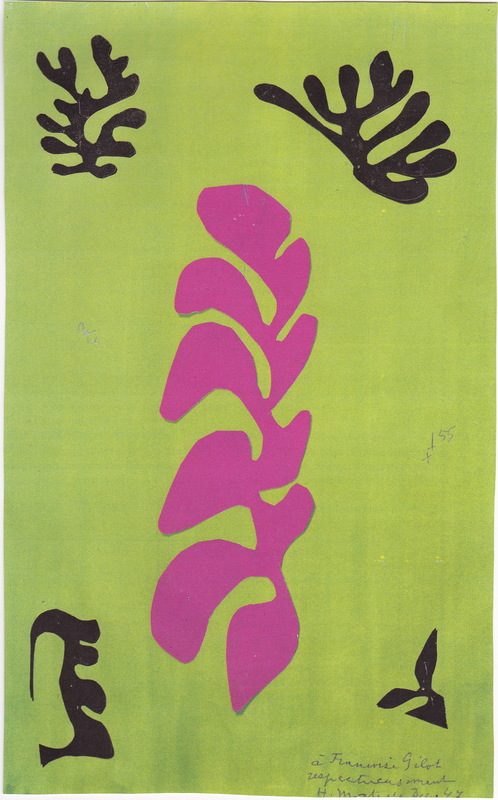 “He got hold of a sheet of paper, painted bright green and a piece of magenta paper and considered the shocking clash of these two colours and the sobering effect that would be achieved by the addition of a black shape”. 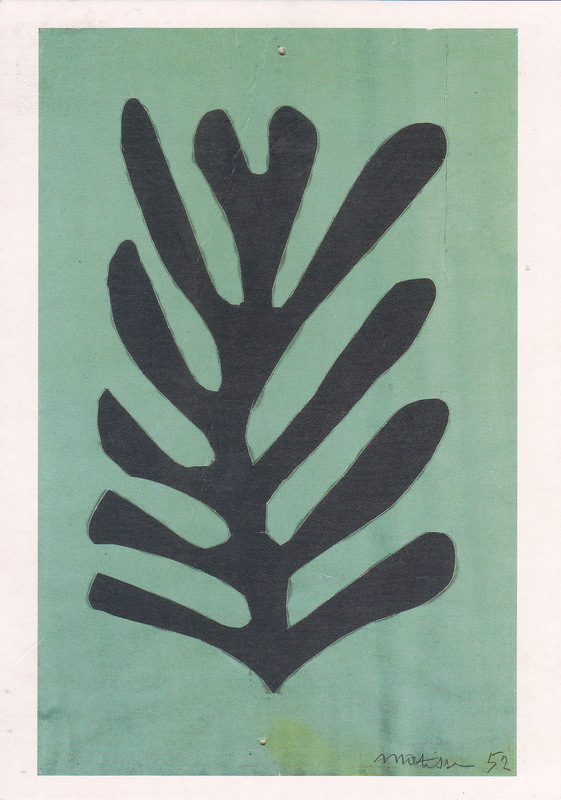 Initially Matisse was frustrated with the black shape he had made for the bottom right of the piece. “The whole composition looked too even, a bit dull …with his gigantic scissors he began to reduce it mercilessly until it became quite small and sharp edged. All the prettiness had been eliminated but in the process of miniaturisation, the energy had been maximised … it was perfect”. And so to gardens. 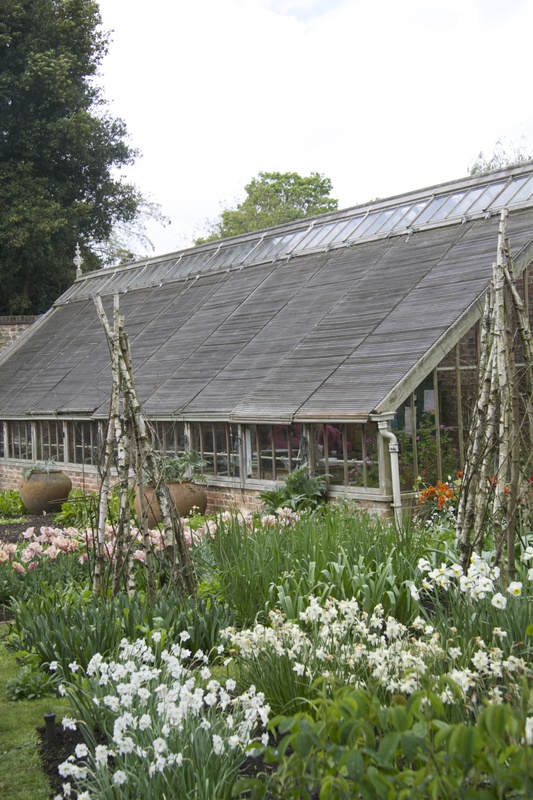 Even if they are never able to come near the perfection of one of these masterful works on paper or in glass – and the stability of a completed artwork will always elude the gardener – the best plantsmen are forever thinking deeply about the elements they work with. The challenge is constant: how best to balance shape and colour, form and texture and the impact of a small amount or large amount of one colour on a small amount or large amount of another. 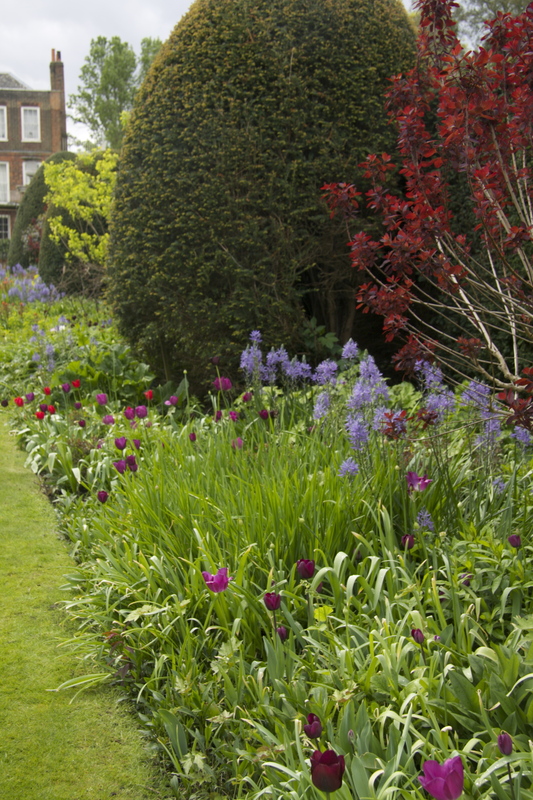 The 150 foot long double border at Petersham House, Petersham. 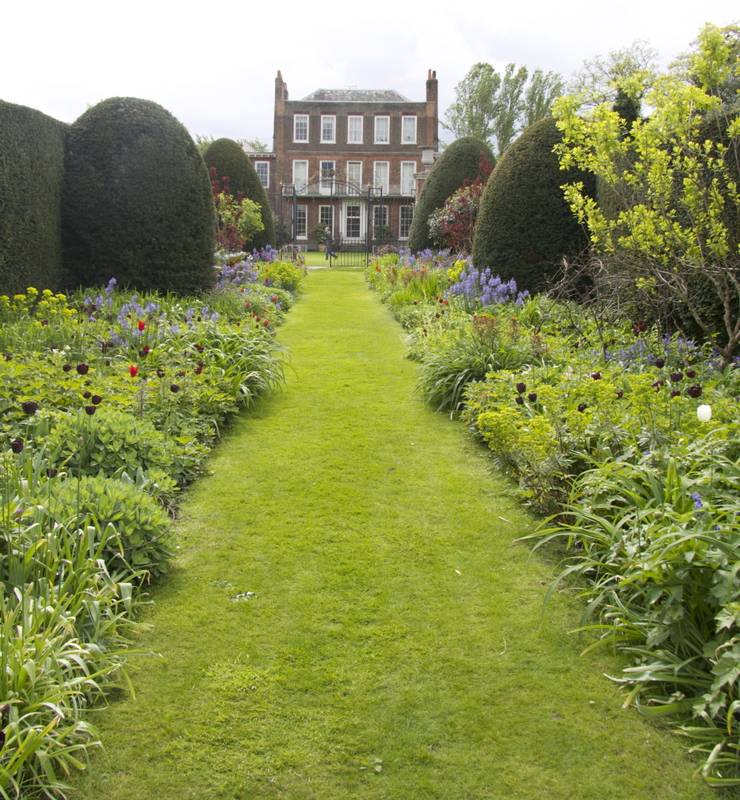 The garden at Petersham House, reached via the delectable Petersham Nurseries, was open for the National Gardens Scheme one Sunday at the end of April and will be open again on June 1st as part of the Petersham Village Open Gardens, as well as on Sunday 20th July for the NGS. 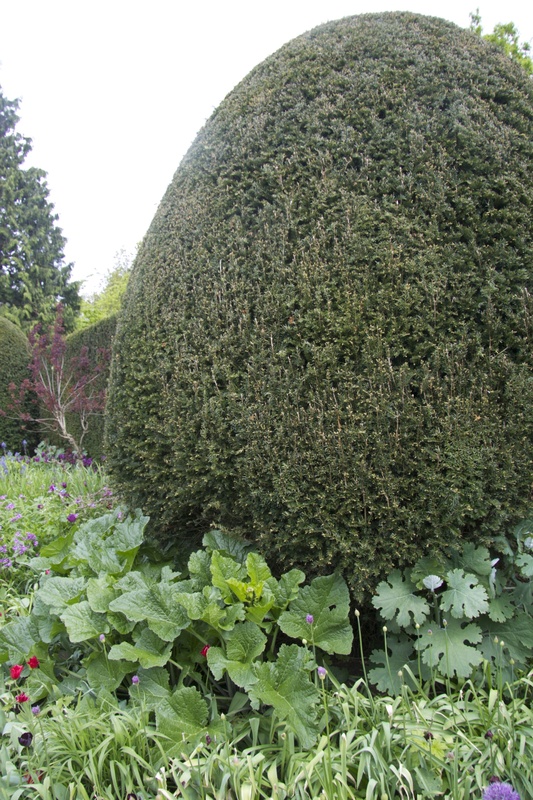 The double borders were originally designed by landscape architect Helen Dooley and have been gently adjusted over the years by the Head Gardener, Rosie Bines. 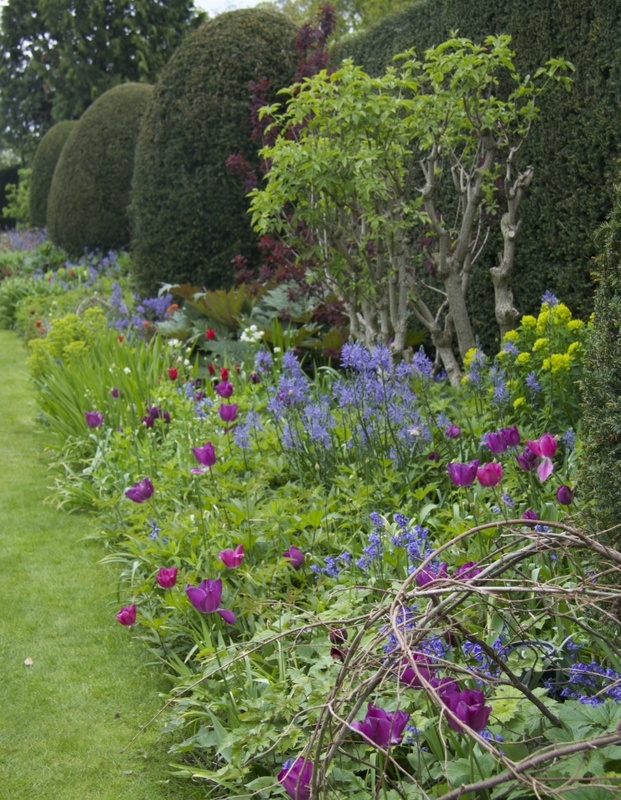 They are a wonderful example of exuberant spring planting and a skillful and inspiring approach to colour, form and texture. 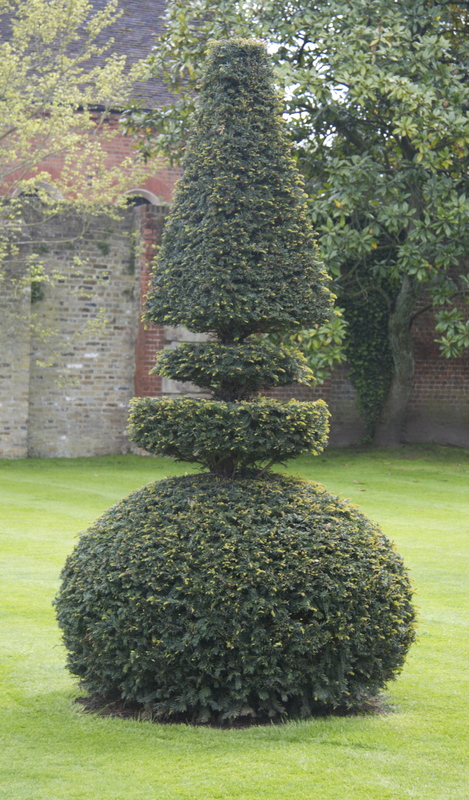 and a complete topiary shape. 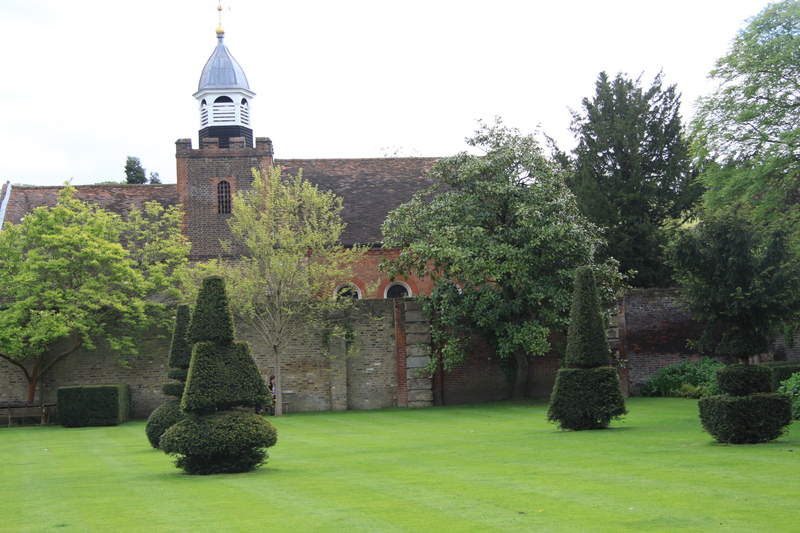 Petersham Church and the garden of Petersham House. 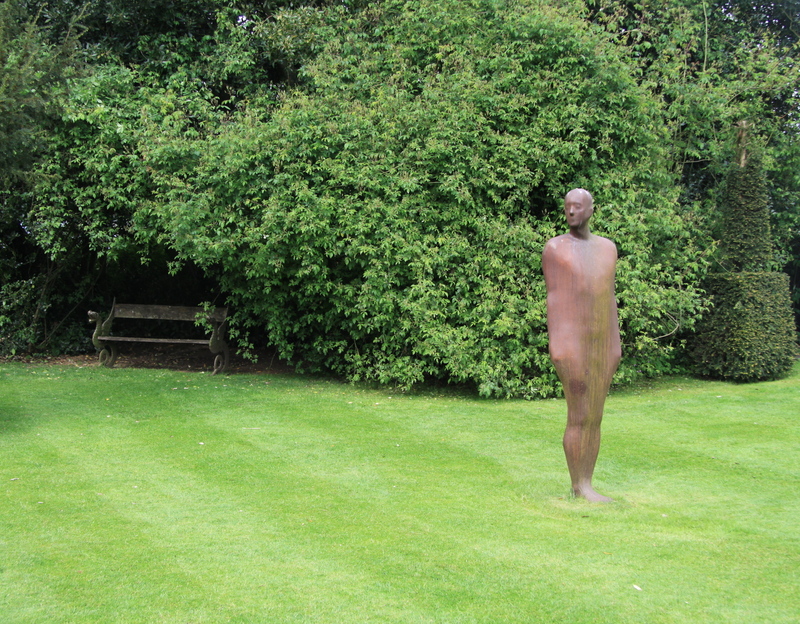 For a moment I am distracted by piece after piece of covetable antique garden furniture which is beginning to feel at home amongst bowers of rambling roses and enclosures of clipped yew – and one cannot fail to be distracted of course by the watchful Anthony Gormley sculpture standing quietly on the grass. Serpent bench in bower with Anthony Gormley sculpture. 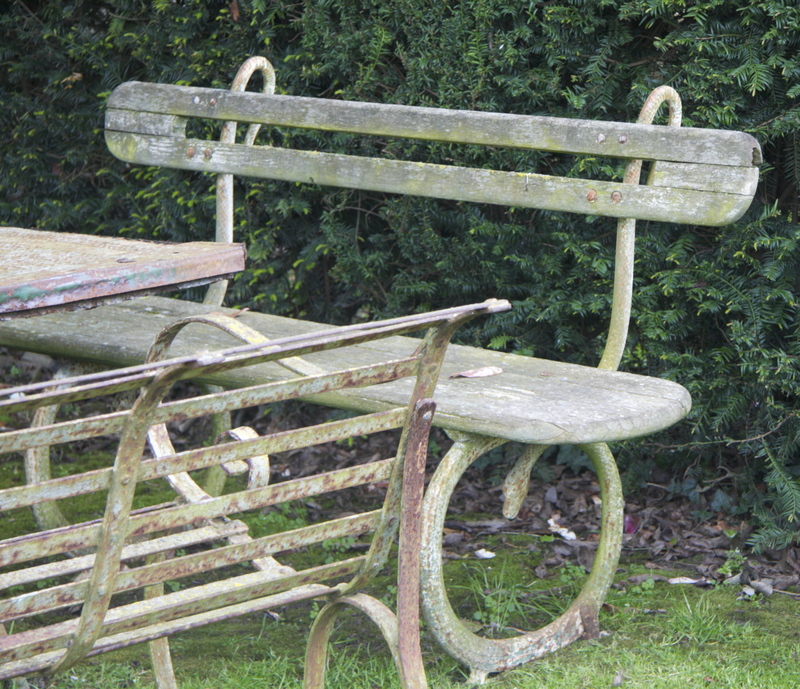 one of a pair of covetable curvaceous dining benches in a yew enclosure. 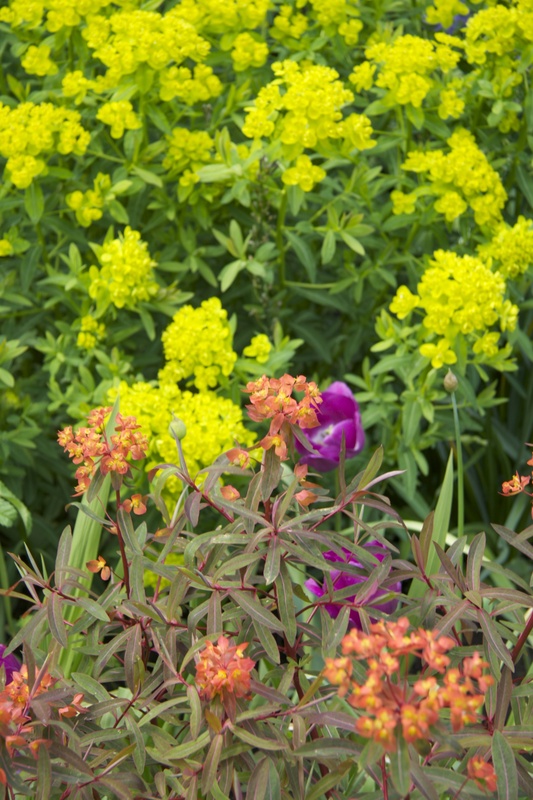 Fiery orange heads of Euphorbia grifitthii ‘Fireglow’ glow against the acid yellow of a different Euphorbia. 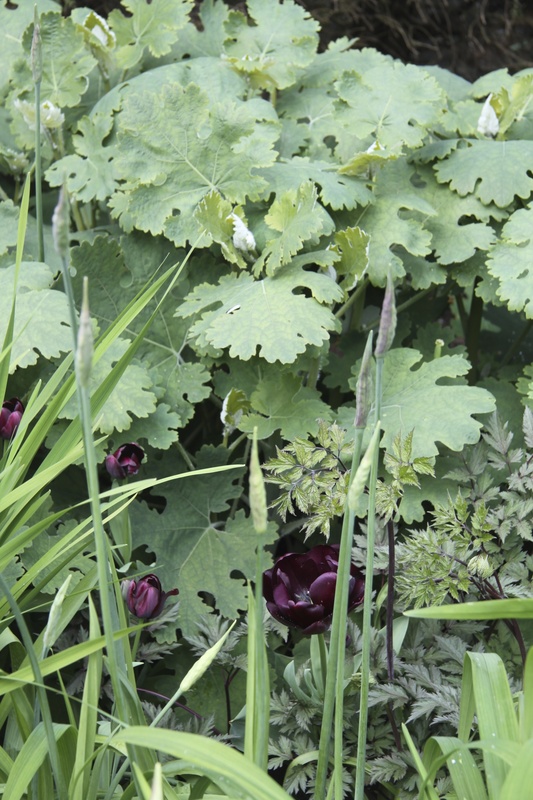 Dark tulips, pointed buds of Nectaroscordum siculum and subdued foliage of Macleaya Cordata. 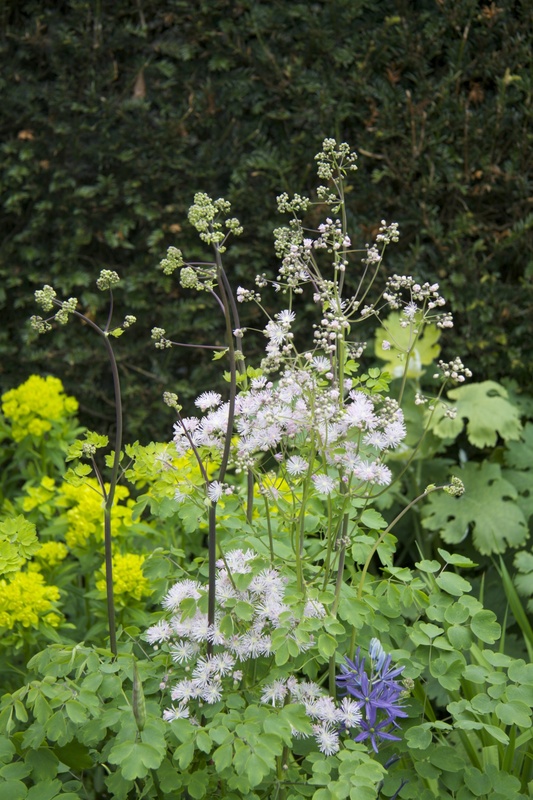 Fluffy, pale pink Thalictrum aquilegiifolium against yew. Sword shaped leaves of Crocosmia and Tellima grandiflora against yew. 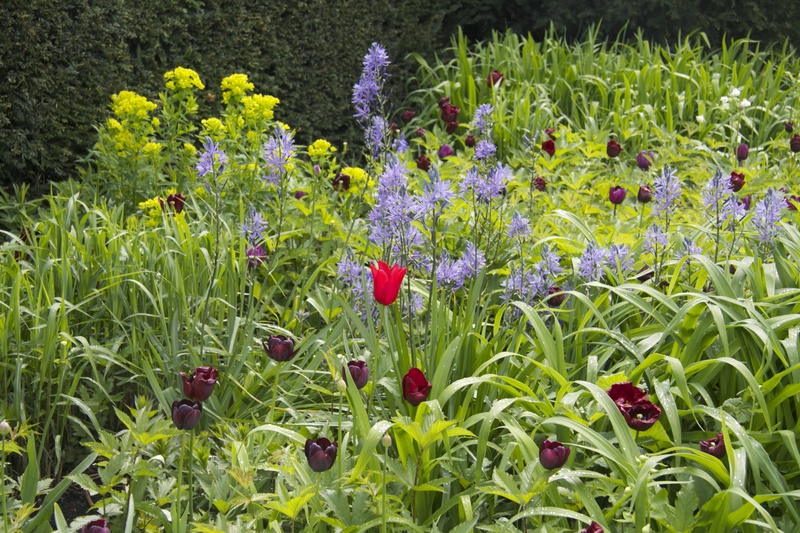 A spectacular combination of Rheum palmatum, bluebells, red tulips and Euphorbia against yew. 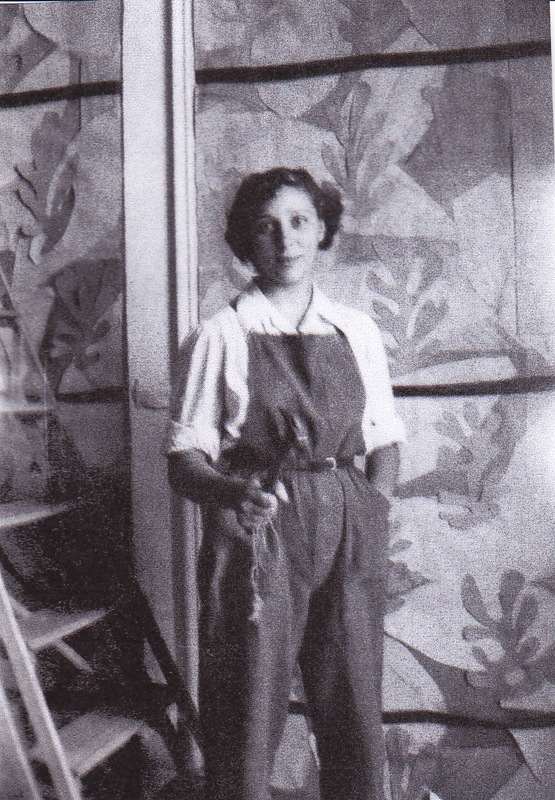 Jaqueline Duhême standing in front of designs for the Tree of Life stained-glass window for the Chapel of the Rosary, Vence. 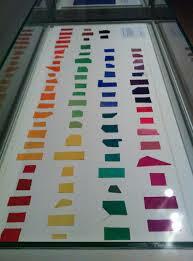 Display from ‘Henri Matisse: The Cut-Outs’ showing the range of colours Matisse was using. 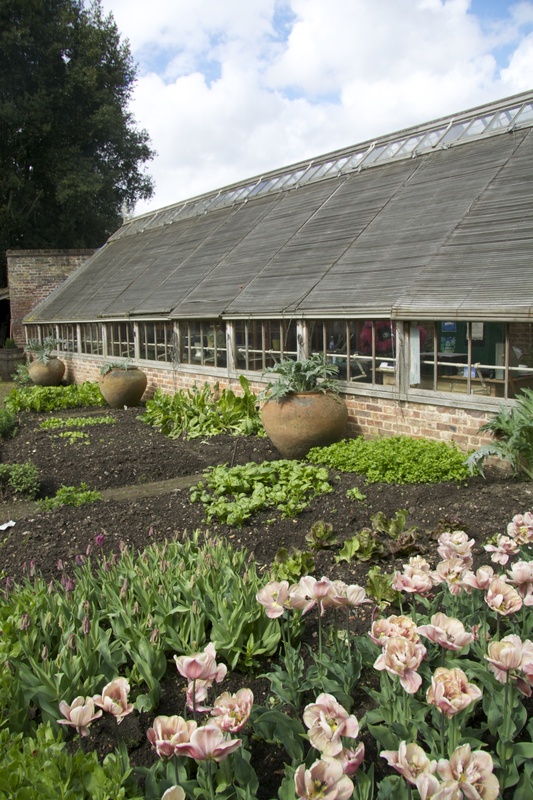 How would the richer note of the orange poppies, still in their trays at the side of the garden affect the whole picture? 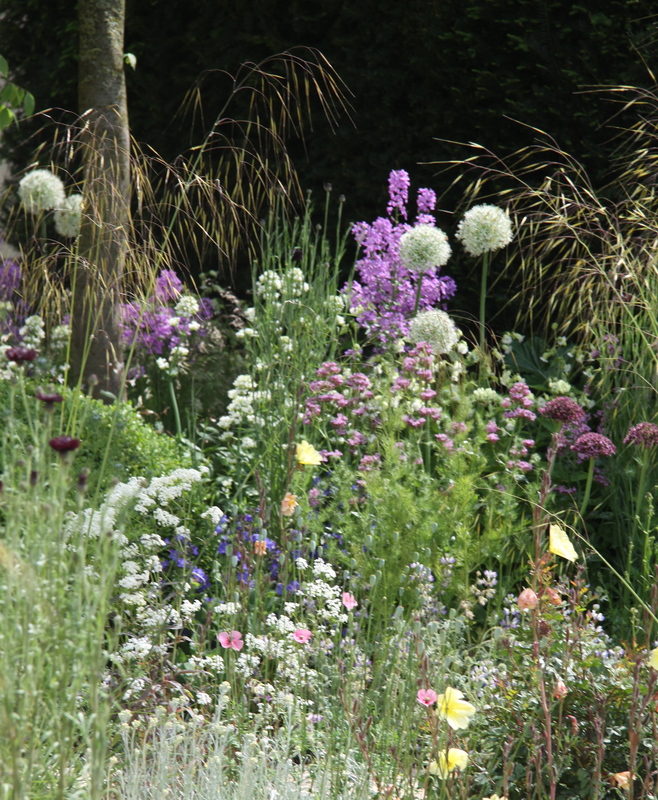 I am finishing this blog after spending the day at Chelsea and the answer is that, in the end, the decision was to go for both pale pink and orange-red poppies. 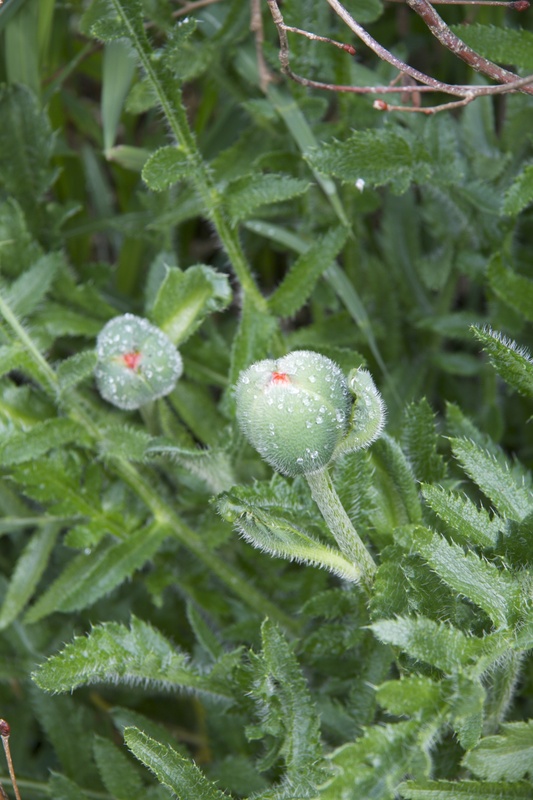 The deep orange poppies offer a dash of fire which has a powerful, intensifying effect on the gentler tones of the surrounding plants. 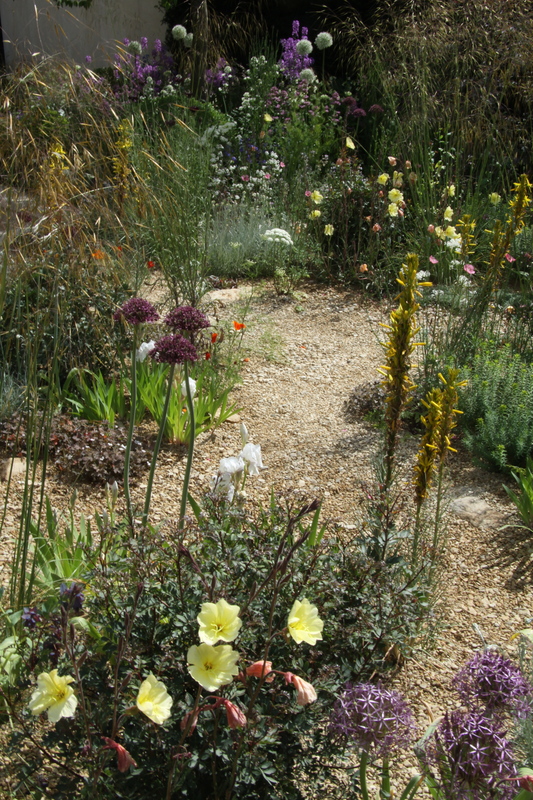 Part of Cleve West’s M&G Garden, RHS Chelsea Flower Show 2014 – with orange-red poppies at the centre. Away from the show garden most plant choices have to be made months or years before they will be required to work together. Here at Petersham the planning and weighing up of possibilities is bearing fantastic fruit. 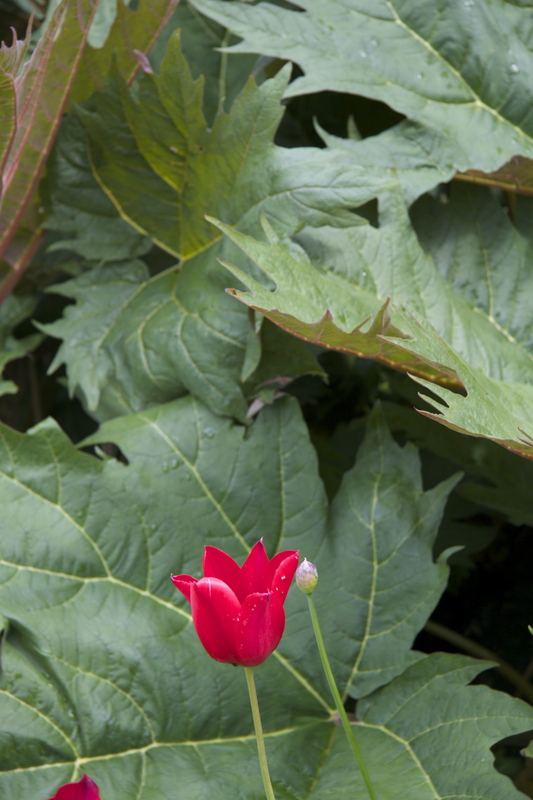 Red tulip against giant Rheum palmatum foliage. 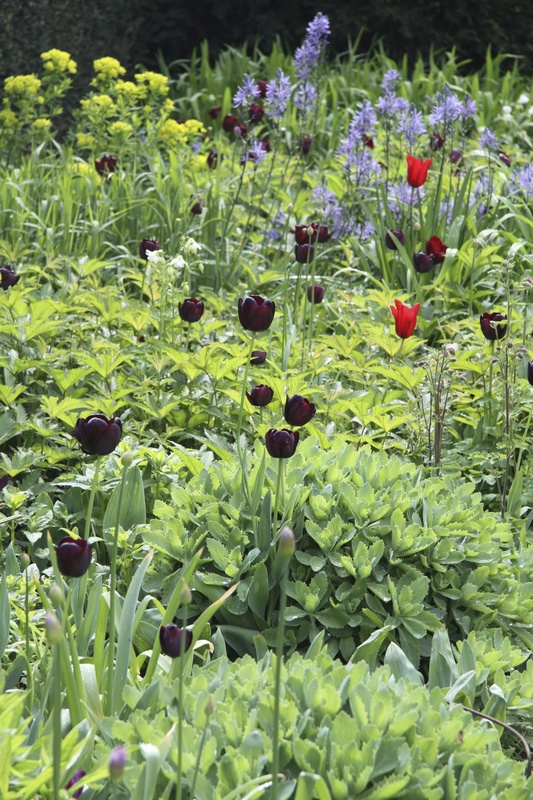 A single red tulip glows like a light bulb against blues and claret. 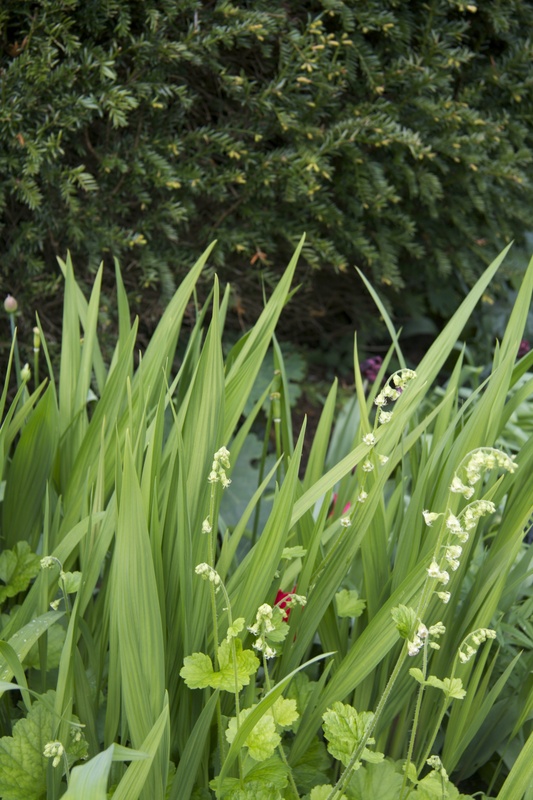 Elsewhere the pale green bell-like flowers of Tellima grandiflora add light and grace to the planting throughout the border. 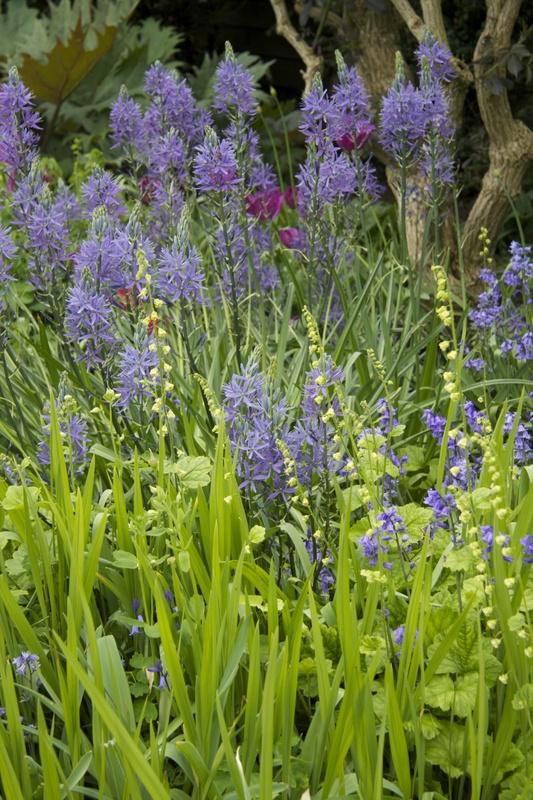 Tellima grandiflora adding a lightness to Camassia. 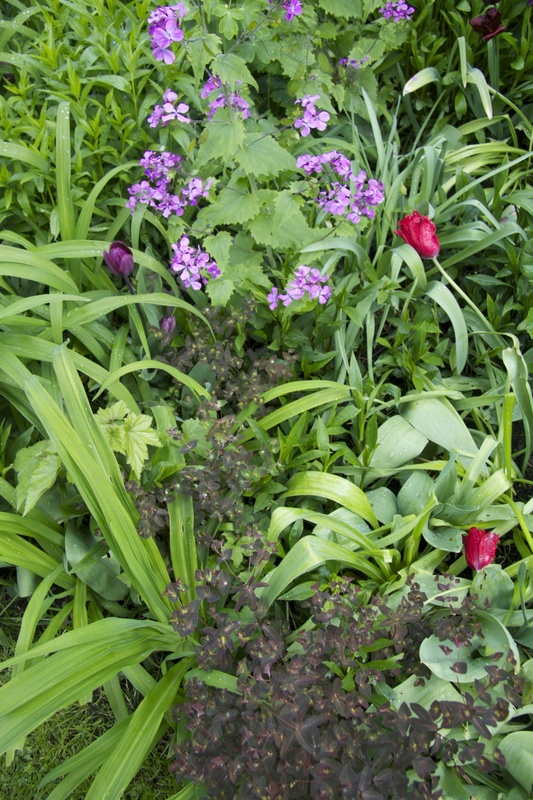 Euphorbia dulcis ‘Chameleon’ adding depth to lilac honesty and tulips. I am reminded again of Jacqueline Duhême’s recollection of her time assisting Matisse: “there was always one colour that would make the others come to light and for Matisse it was usually blue that made the yellows, oranges and reds brighter”. 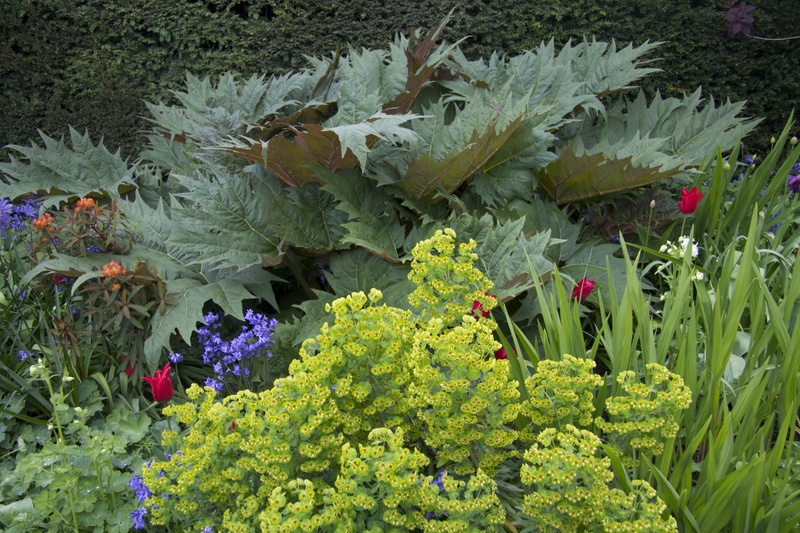 Torch-like shrubs of alternating claret and bright green Cotinus parade up the borders – their leaves growing daily and the pool of colour they provide getting bigger and having more influence day by day: Cotinus shrubs parade up the borders. 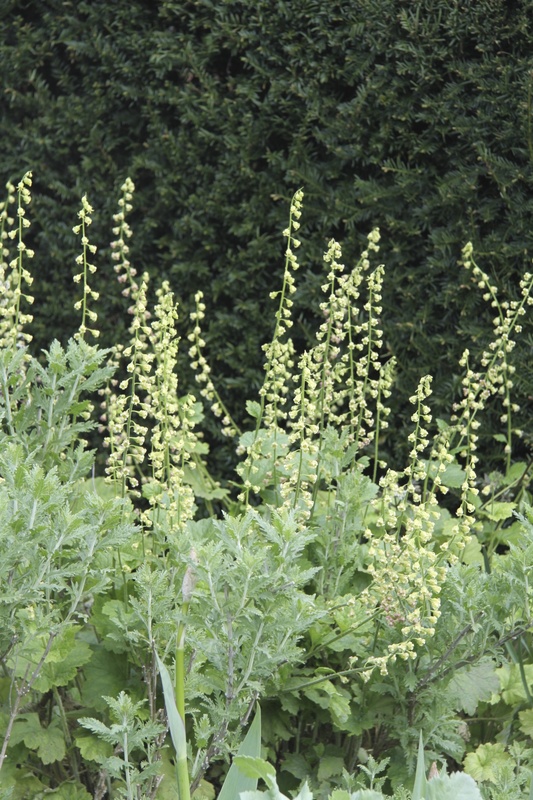 And the lush green leaves of Crambe cordfolia, which for now sit so demurely at the feet of the handsome yew acorns, will soon spin out into such huge airy clouds of white flower that for a while you will barely be able to squeeze past. The picture is about to change completely. 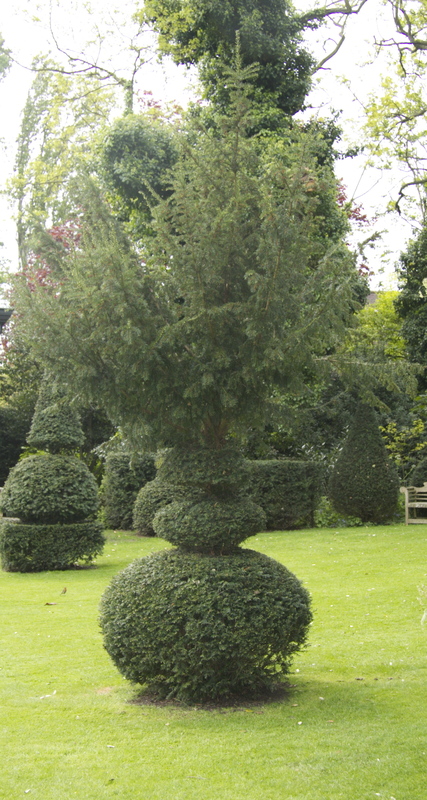 Crambe cordifolia leaves (left) at the base of a topiary yew acorn. Silver birch plant supports underplanted with herbs and narcissus. 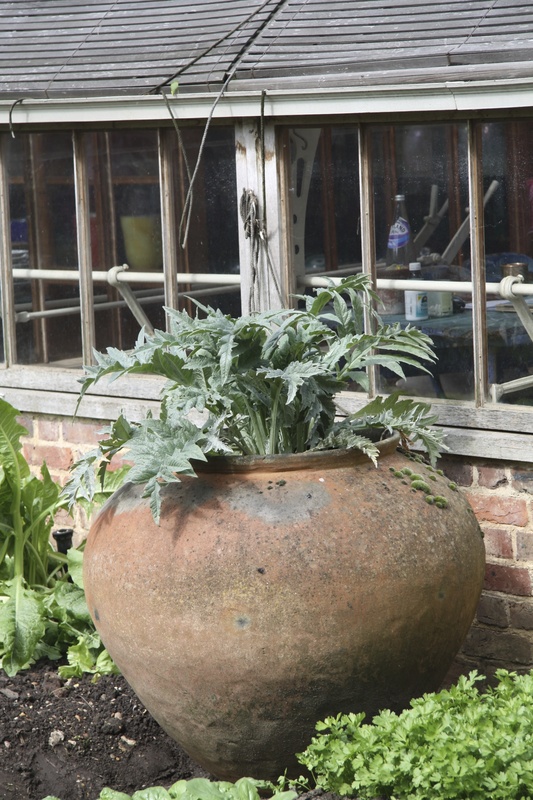 I pass a wonderful small fleet of fat terracotta pots each housing a greedy artichoke plant. 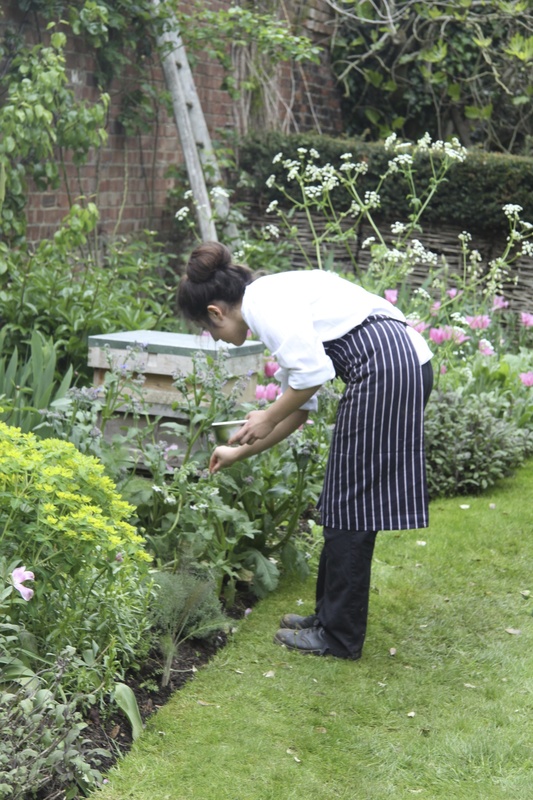 It is a delight to see a young chef darting around the kitchen garden collecting flowers of borage, thyme and chives to use in the cafe and restaurant: And I love the way that tulips and cow parsley are growing together with the culinary herbs: Purple sage with tulips and cow parsley. 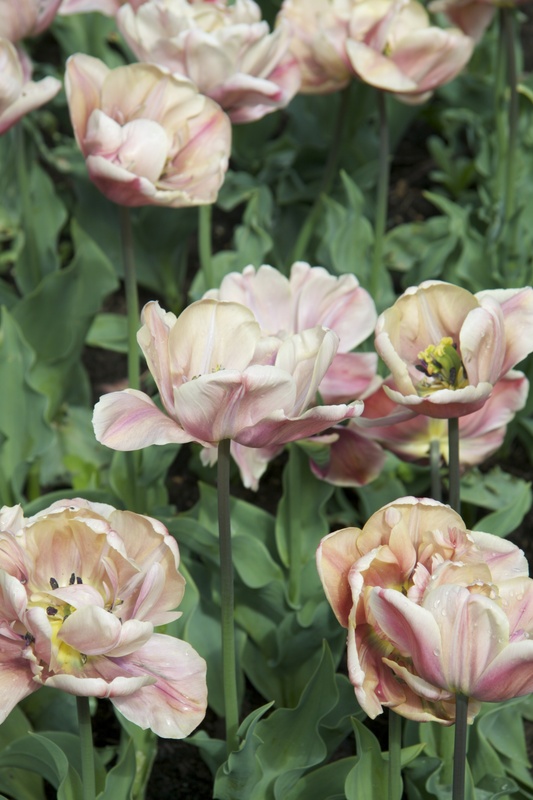 Next to the garden gate is a luscious patch of blousy peach coloured tulips, Tulipa ‘La Belle Epoque’. 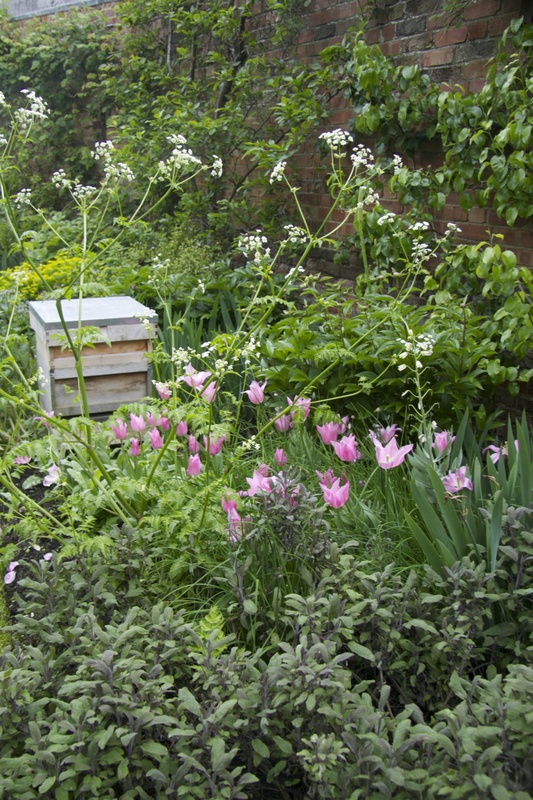 I absolutely want some of these to plant next September. 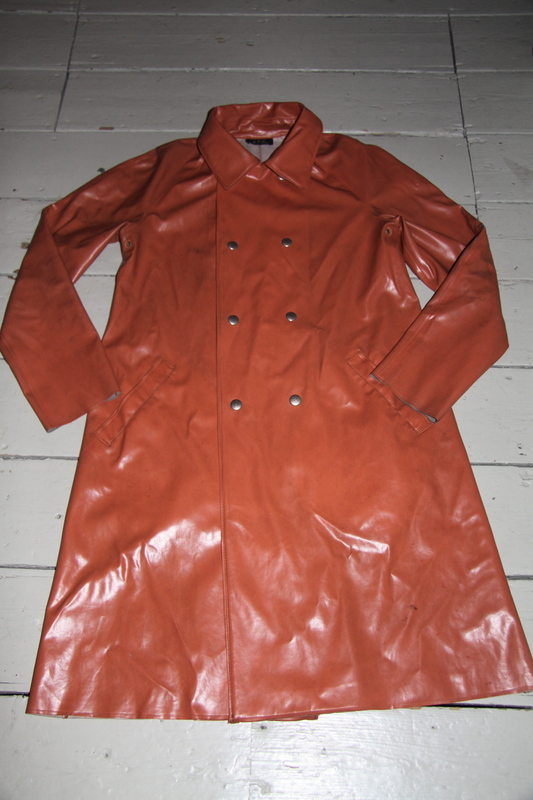 My tomato-soup coloured gardening mac. Next to it is a photograph of my idea of the ultimate swimming pool – the pool at the hotel, La Colombe D’Or in St Paul de Vence in the South of France. It is, of course, the perfect place to stay if you want to visit Matisse’s Vence Chapel in person. 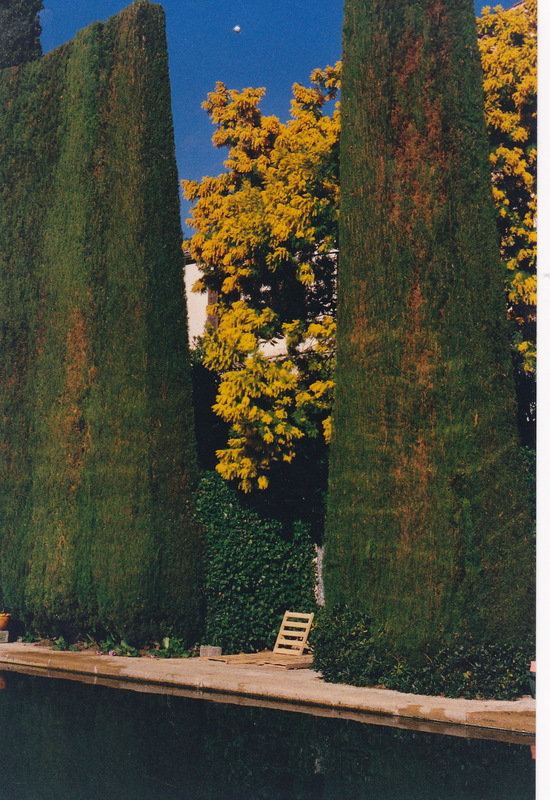 Everything comes together: the blocky deep green of tightly clipped Cypress – sobering, balancing – and the exuberant yellow of the mimosa which is made made more heady and electric by the richness of the blue sky. The swimming pool at La Colombe d’Or. This entry was posted in Gardens, Italian Gardens and tagged Anthony Gormley, antique garden furniture, Camassia, Chapel of the Rosary, Chris Marchant, Cleve West, Crocosmia, Cypress, double border, Euphorbia dulcis 'Chameleon', Euphorbia grifithii 'Fireglow, Françoise Gilot, Helen Dooley, Henri Matisse, Henri Matisse - The Cut-Outs, Jaqueline Duhême, La Colombe D'Or, M&G Garden, Mimosa, National Gardens Scheme, NGS, Orchard Dene, Petersham Church, Petersham House, Petersham Nurseries, Petersham Village Open Gardens, Picasso, red gladiolus, Rheum palmatum, RHS Chelsea Flower Show, Rosie BInes, St Paul de Vence, Stipa gigantea, Tate Etc Magazine, Tate Modern, Tellima grandiflora, Thalictrum aquilegiifolium, Vence, yew on May 21, 2014 by nonmorris.